I had worn this outfit to work, unsure of whether my cousin and I were going to be able to shoot at the end of the day. We decided at the last minute that we would, and since I always have a pair (or two J ) of heels stashed in the trunk of my car, I told myself “why not?” and decided to just go ahead and shoot what I had worn to work that day. For years, I have always separated clothes/outfits that I decided were appropriate for work from the ones I would wear on a casual/fun /dressier occasions. Since the more “fun” clothes were strategically placed in the deep recesses (okay, maybe not even deep at all lol) of my closet, I never get to see them when I am running around like a headless chicken EVERY single morning. One day, I decided that maybe I should stop with labeling which articles are for what occasion and just get the heck dressed, look appropriate for work and be on time!!! So if you are the same way as I am and stuck in an office wardrobe rut, take a less boring piece from your more “fun” clothes and find yourself MAYBE smiling more for the rest of the day … or not, lol! Thank you so much for reading, please check out my Instagram @my_sinina (I know, I know I’m bad at social media channels but at least I have this)! J and see you on my next post! thanks for the sweet compliment nadja! thank you so much Monique!!! 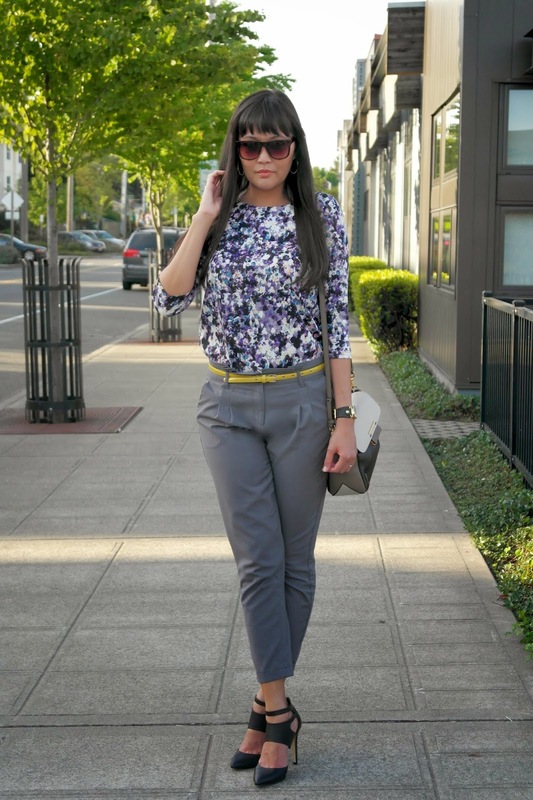 Perfect office look without being boring. I love the pop of color. This is a great look on you. Absolutely love the shoes! Beautiful print of your top ! I like floral print, pretty bag too, kisses! Oh love this! Those shoes are awesome.